I think I have a problem. Do they have a 12-step program for Nutter Butter Lovers? I’ve been using Nutter Butters a lot lately. I made ice cream, a halloween treat, and even another crust with them just a couple weeks ago. 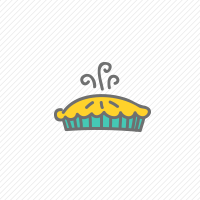 And now I bring you this pie. With yet another Nutter Butter theme. But this one isn’t my fault. This one is all my husband. 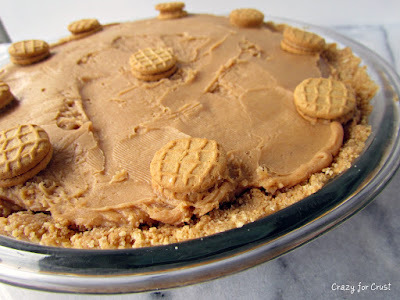 We were at dinner one night awhile ago (alone, so of course we were talking about my blog and food, because that’s good date-night banter) and he said I should make a Nutter Butter crust. Thousands of ideas popped into my head. Then he said, oh, and make a peanut butter filling too. And then he mentioned Nutella. And I knew I was going to make this pie. Unfortunately, I thought he was being all original and I was going to take the blogging world by storm with his ingenious idea of a Peanut Butter Nutella Nutter Butter Pie. It would be amazing. And then I Googled it. Maybe the idea isn’t original…but I did make up the recipe as I went along, so we can pretend it’s all ingenious and original and fabulous, right? And you can totally make this ahead of time, because while it’s good room temp or from the fridge, it’s even better frozen. Make the crust: Finely crush Nutter Butters in a food processor. Stir in melted butter and press into the bottoms and sides of a 9” pie plate. Chill until ready to use. Make the whipped cream: Whip heavy cream and brown sugar in an electric mixer using whisk and a cold bowl until peaks form. Chill until ready to use. 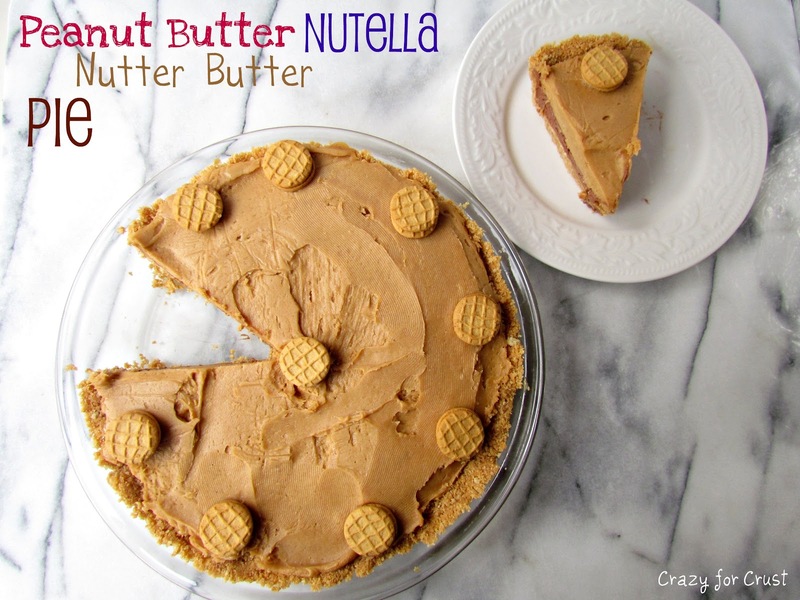 Make the Nutella layer: Beat Nutella, cream cheese, and brown sugar with a hand mixer until combined. Fold in 1/3 of the whipped cream. Spread in the prepared crust and chill until ready to add the next layer. 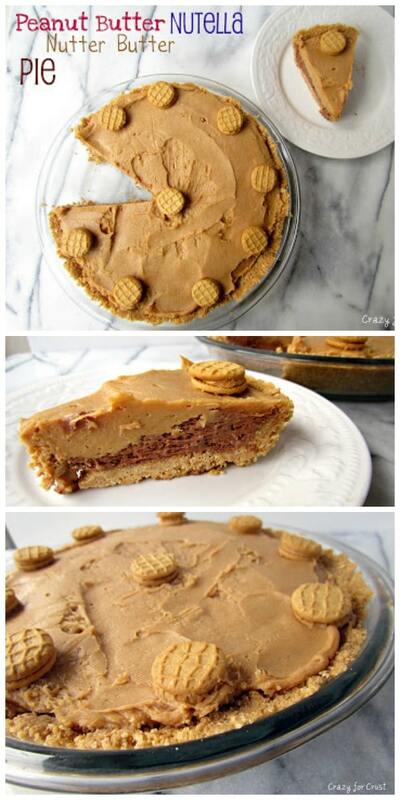 Make the peanut butter layer: Beat peanut butter, cream cheese, and brown sugar with a hand mixer until creamy. Fold in the remaining 2/3 whipped cream. Spread over Nutella layer. Garnish with mini Nutter Butters, if desired. 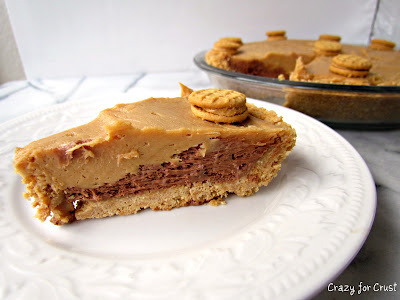 This pie is good chilled or room temperature, but it is even better frozen! Cover with plastic wrap and store in refrigerator or freezer until ready to eat.